I always remember to post photos of the city decorated for Christmas, but not for Halloween. Last night, I volunteered with my co-workers at Light the Night for the Leukemia and Lymphoma Society and had a lot of time to admire the window dressings along Maiden Lane. 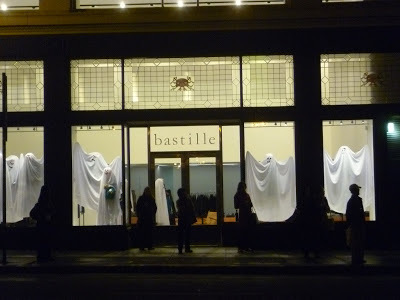 Aren’t these sheet ghosts at Bastille just perfect! Especially with all the commuters imperviously waiting for the bus in front.